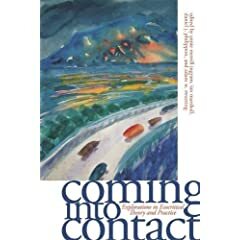 I received a copy of Coming into Contact: New Essays in Ecocritical Theory and Practice (University of Georgia Press, 2007) in the mail early this week, several years after I wrote my contribution, "Composition and the Rhetoric of Eco-Effective Design," an ASLE conference back in 2003. It's bizarre to finally see it published after not thinking about it for so long. The more time I spend publishing content online, the longer the print cycle seems, especially for academic books. But it's good to see the book published, and it looks like an interesting collection. "A snapshot of ecocriticism in action, Coming into Contact collects sixteen previously unpublished essays that explore some of the most promising new directions in the study of literature and the environment. They look to previously unexamined or underexamined aspects of literature's relationship to the environment, including swamps, internment camps, Asian American environments, the urbanized Northeast, and lynching sites. The authors relate environmental discourse to practice, including the teaching of green design in composition classes, the restoration of damaged landscapes, the persuasive strategies of environmental activists, the practice of urban architecture, and the impact of human technologies on nature. The essays also put ecocriticism into greater contact with the natural sciences, including elements of evolutionary biology, biological taxonomy, and geology. Engaging both ecocritical theory and practice, these authors more closely align ecocriticism with the physical environment, with the wide range of texts and cultural practices that concern it, and with the growing scholarly conversation that surrounds this concern."